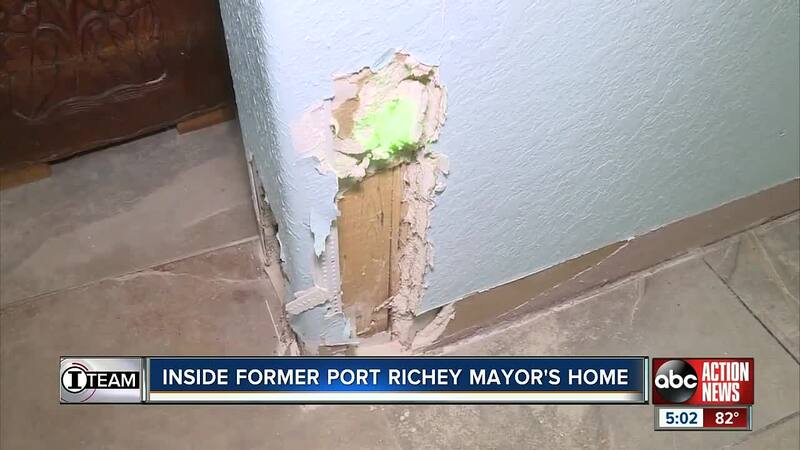 PORT RICHEY, Fla. — Attorneys for former Port Richey Mayor Dale Massad showed us inside his home for the first time since his February arrest on multiple counts of attempted murder. Massad's attorneys say their client fired what were intended as warning shots after he woke up to a SWAT team at his. They were there in the early hours to serve a search warrant. Pasco County Sheriff Chris Nocco said hours after the crash that Massad’s reckless behavior could have cost deputies their lives. Massad's lawyers said Friday that the shots were just meant to scare off intruders, and deputies were never actually in harm's way. Attorneys Bjorn Brunvand and Denis de Vlaming showed us around Massad’s house for the first time today. They say Massad was sound asleep in his bed shortly after 4 a.m., when deputies first knocked at his door. The attorneys claim their client didn't hear the deputies knock. They say he was only woken up when they shot out his front lock with a shotgun and detonated an explosive device inside his home. “According to the police report, from the time they banged on the wall until the time the shots were fired, only 38 seconds had taken place. So he was woken from a sound sleep and the explosion went off and he fired the shots,” said de Vlaming. At that point, his attorneys say Massad fired two warning shots. One bullet hit an elevator and the other hit a wall on top of an entry staircase. Massad's attorneys say none of the deputies were inside the house when the shots were fired, and neither bullet came close to hitting any of them. “They were never, ever, ever at risk. A bullet would have had to take a hard right hand turn to hit anybody that was down those set of steps,” said de Vlaming. The attorney said neither Massad nor his girlfriend, who was in bed with him at the time of the raid, realized they were actual deputies at the time Massad fired the shots. They say his girlfriend called 9-1-1 then to try to verify whether or not law enforcement was outside. “They were warning shots. His house had been burglarized twice. From the 9-1-1 tape, you can tell that both of them didn't know if these were real cops or they're fake cops. There are plenty of times when fake cops have come to rip people off or do a home invasion burglary,” de Vlaming said. Massad's attorneys say their client should be granted bond, which he has been denied by the judge. They also say they've already been offered a plea deal, but they say they plan to fight the attempted murder charges in court. If you have a story you’d like the I-Team to investigate, email us at adam@abcactionnews.com.